Operation VITTLES, the Berlin Airlift, has gone down in history as the first time military airlift was used as an instrument of United States national policy, and the first time transport aircraft were used to sustain a city under "seige." Yet it is important to remember that the airlift would not have suceeded had not the Russians and East Germans elected to forego the use of military action to prevent the flow of supplies into the divided city of Berlin. Although the German capital city of Berlin lay more than 100 miles inside the portion of Germany that was occupied by the Russians, the city itself was divided into sectors, with the United States, Great Britian, France and the Soviet Union each responsbile for the administration of the sector over which it was given dominance. Naturally, the Soviets elected to convert their part of the city into a Communist dictactorship, along with the rest of the country that was then under their control. But while the Communist method was established in East Germany, the democratic rule of the western sectors flourished as an island within the darkness of the rest of the country. The Soviets attempted to gain complete control of the city time and time again. Finally, on June 15, 1948 they declared that the Autobahn leading into Berlin from West Germany was "closed for repairs." Three days later road traffic between the sectors was halted and on June 21 all barge traffic into the city was stopped. On June 24 the Russian announced that due to "technical difficulties" there would be no more rail traffic to and from Berlin. The following day they announced that the Russian sectors would not supply food to the sectors of the city that were under Western administration. In response to the Soviet actions, the United States military government in Europe decided to mount an airlift of supplies into the city until the crisis was solved. On June 26, 32 flights by United States Air Forces, Europe C-47s transported 80 tons of food from Weisbaden in West Germany into Tempelhof Airport inside the city to begin what came to be known as the Berlin Airlift. As it appeared there was going to be no easy solution to the problem, the USAF dispatched 35 four-engine C-54 transports from troop carrier squadrons in Alaska, Hawaii and the Caribbean to Germany on June 28, even while the British began their own airlift into the city. The following day, USAF BGen. Joseph Smith, commanding officer at Weisbaden, was named commander of Operation VITTLES. On July 1 the Soviets withdrew from the joint command organization in Berlin, indicating their intentions to face down the West for control of the divided city. The United States immediately developed a resolve to overcome the Soviets, and the entire USAF and US Navy air transport apparatus was placed on a wartime footing. As it became apparent that the airlift would continue for some time, certain officers in the newly created Military Air Transport Service, particularly MGen. William H. Tunner , who had commanded the Air Transport Command Hump Airlift during the final months of World War II, began pressuring the Air Force to give control of the airlift into Berlin to them, thus introducing military politics into what was already largely a political operation. It has been reported that Tunner roamed the halls of the Pentagon trying to find someone to assign him to command the airlift. He finally got an under-secretary of the Army who had served with him in China to recommend that he be sent to Germany to take command of the operation. While the Air Force elected to keep the airlift under USAFE control, it agreed to transfer Tunner to Europe. He immediately asked for his old staff from the China Air Ferry to accompany him to Germany. He arrived in Europe on July 28, and Operation VITTLES was renamed the AirLift Task Force, of which he was given command.Two months later, the Combined Air Lift Task Force was established, with Tunner in overall command and RAF Air Commodore J.W.F. Merer as his deputy, to control all airlift operations. Tunner's first action was to order an organized flow of traffic from the onload bases to the delivery points in Berlin. All flights would be under IFR rules and a policy was established that if a pilot missed an approach, he would return to his onload base rather than reentering the flow of traffic. Although this sounds inefficient, the new policy actually saved time and increased efficiency as the air traffic controllers were no longer required to shift airplanes around to accomodate those that had to be reinserted into the traffic patterns. As the airlift continued, the Air Force ordered more and more C-54s and their crews to Germany for the airlift. Airplanes and personnel came largely from troop carrier squadrons, both in the United States and overseas, although some also came from MATS units as well as US Navy air transport groups. One group, the 317th Troop Carrier Group, moved to Germany from the Far East to take part in the airlift. While in Europe the squadrons were assigned to one of five troop carrier groups, the 60th, 61st, 313th, 317th and 513th. MATS established ferry routes to fly C-54s to and from Europe from repair depots in the United States and to transport aircraft engines and other parts to the airlift bases. RAF transport operations were under the control of the 46th Transport Group. To increase tonnage, the daily totals of each group were published in a newspaper that went to all airlift personnel as "The Task Force TIMES." Ironically, it was a US Navy transport squadorn, VR6, that consistently had the best record. VR6 was assigned to the 513th TCG while the other Navy squadron, VR8, was part of the 61st TCG. American servicemen in World War II were noted for their compassion for children in the countries where they fought, and this was equally true during the Berlin Airlift. In mid-August, just a few weeks after the airlift began, Lt. Gail Halverson, a C-54 pilot, decided to begin dropping tiny bundles of candy, chewing gum and other goodies to the crowds of children he had noticed standing outside the gates of Tempelhof Airport. "The Task Force TIMES" published an article about "the candy bomber's" drops, and the story was picked up by "Star and Stripes," and then by newspapers in the United States. Soon packages of candy and chewing gum were pouring into Halverson's mailbox and he was given permission to conduct Operation "Little Vittles" on his flights into Berlin. While the airlift was begun with the venerable C-47, the higher payload capacities and faster speeds of the C-54 dictated that they be used exclusively on the airlift in the American sectors. On September 14 a detachment of C-82 "Flying Boxcars" from troop carrier bases in the United States joined the airlift to transport cargo that was too bulky for C-54 transport. Though, with one exception, they were not used on the Berlin flights, regular flights from the United States to Germany were initiated by the huge C-74 "Globemasters" to transport engines and other mechanical parts for C-54s. A single C-74 was requested by Tunner for "a test" and flew on the airlift for about six weeks in the late summer of 1948. British transports included Dakotas (C-47s) along with Yorks, Hastings and even Sunderland flying boats. Scottish Airways, a British concern, operated a few Liberator bombers that had been converted into tankers hauling diesel fuel. In preparation for the European winter, the newly developed Ground Controlled Approach Radar system (GCA) was shipped to Europe for installation at Tempelhof, with a second set installed at Fassberg. With the installation of GCA, all-weather airlift operations were insured. But GCA did not solve the problem of icing in the clouds. Bad winter weather would be the primary obstacle to safe airlift operations. 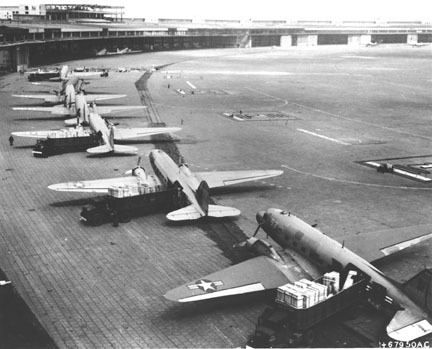 In April , 1949 the GCA unit at Tempelhof claimed a world's record for GCA operations; during one six-hour period they brought in an average of one transport every four minutes. Once the various aspects of the airlift apparatus were established, airlift operations became more or less routine, with close scheduling of airplanes in and out of the various airports and loading and offloading being the major considerations. The absence of enemy opposition allowed a smooth flow of airplanes that was hampered only by inclement weather. Loading and off-loading of the airplanes was back-breaking work as the C-54s did not allow the use of palletized cargo techniques. Coal and flour in sacks seemed to constitute the bulk of the cargo carried on the airlift, and each item had to be loaded and offloaded onto and off of the airplanes by hand. In May, 1949 the Soviets agreed to end the blockade of the city. On May 12 trains and motorized vehicles were allowed to pass through checkpoints for the first time in 320 days. But within a week transportation again ground to a halt as railroad workers struck against Soviet control of the railroads and the airlift temporarily resumed. Airlift operations continued into the city until the end of July, when the Berlin Airlift officially ended, though supplies would continue to be delivered to Berlin on a lessor scale through October. The Berlin Airlift was an around-the-clock operation with the objective of maintaining a constant flow of essential commodities into Berlin. It was an exercise in efficiency commanded by a man who was an expert in getting the most from the resources under his command, General Tunner. By the time the airlift officially ended on July 31, 1949 US and British transports had carried a total of 2,231,599.8 tons into Berlin, with the RAF transporting 516,014.2 of the total. The maximum monthly tonnage was in July, 1949 when 253,090 tons were carried. Seventy-seven people lost their lives to various causes during the airlift, 39 RAF, 31 American airmen and seven Germans. There is a common misconception that when General Tunner and his staff arrived in Germany, the airlift became a MATS responsibility. In fact, this was never the case, although MATS tried to claim responsibility, which has caused considerable confusion. The Air Lift Task Force was directly under the command of United States Air Forces, Europe for its duration, When Tunner first arrived, the USAFE commander was Lt. General Curtis Lemay, who was nearing the end of his tour as the senior US Air Force officer in Europe. Lemay more or less gave Tunner carte blanche, including authoriziation to communicate directly with MATS Headquarters rather than following the proper chain of command. In October 1948, a few weeks after Tunner assumed command of the airlift, General John K. Cannon took command of USAFE. Cannon was a no-nonsense officer who believed firmly in the precept of theater command for all military operations, and he immediately informed Tunner that he was under his command, and was no longer in MATS. He ordered Tunner to discontinue direct communications with MATS and informed him that all communications with other headquarters would go through USAFE. Click Table of Contents to return . Join the Troop Carrier/Tactical Airlift Association!